Architecture firms Hassell and MVRDV have imagined a scheme featuring floating stadiums, emergency castles and pop-up restaurants, which aims to build resiliency to flooding in South San Francisco and foster the local community. Australian firm Hassell and Dutch firm MVRDV teamed up for Resilient by Design's Bay Area Challenge ideas contest, which calls for ways to help protect San Francisco and the surrounding region from the effects of climate change and natural disasters. The duo's team – named Hassell+ – are among the competition's 10 shortlisted groups of architects and engineers that are currently researching and designing schemes. Hassell+'s Connect and Collect response ties together defensive strategies with urban developments. It suggests making the cities in the bay less vulnerable in the event of disaster by cutting through the current transport infrastructure, and creating links between the towns located uphill and the shoreline below. The corridors are imagined as either streets that form emergency routes or creeks that create passageways for excess water to prevent flooding. New paths would also open up space to build facilities for the local communities alongside. Hassell+ then developed a "suite of adaptable structures" – including floating sports stadiums, emergency castles and pop-up restaurants – for members of the community to chose from. It also features smart schools, aquaponic farms, running tracks and greenhouses. "Climate change is real, by the end of the century there will be a sea level rise of two metres," said MVRDV co-founder Nathalie de Vries. "Bay Area communities respond to this challenge in a multi-disciplinary approach to upgrade their general resilience." Public plazas would be created at either end of the pathways, which follow the slope down to the water's edge. Spaces along the shore, known as Shoreline Collectors, will be designed to absorb excess water. Meanwhile, areas set at the top of a hill in the town centres, called Uphill Collectors, would feature systems that collect water to prevent flooding, and store and filter it for later use. Both areas would also house facilities for disasters like assembly centres, emergency shelters and water supply, first aid and food supply. 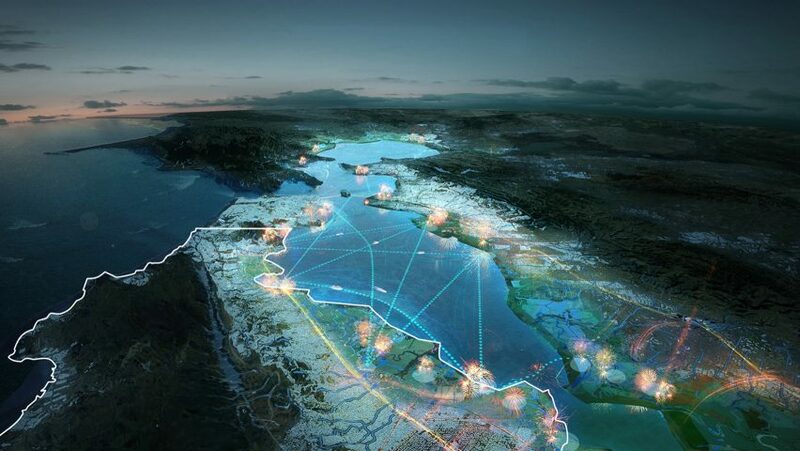 Hassell+ developed the Connect and Collect proposal for the entire Bay Area as part of the first phase of the Resilient by Design Challenge. It has begun to refine the scheme for South San Francisco, a city in San Mateo County, for the contest's next phase. "San Mateo County is the perfect testing ground for solutions that could unlock potential for shoreline communities around the entire Bay Area," said Hassell principal Richard Mullane. "We developed a flexible toolbox for San Mateo, which helps the local community by revitalising public spaces that collect and connect people and water," added de Vries. So far, the teams' suggestions include developing the city's Grand Avenue with community gardens, wifi hotspots and cycleways. Pop-ups for local businesses are also intended for vacant plots. Along the water, the Colma Creek Shoreline Park would feature bike sharing, pedestrian bridges, parkland and a magnet-shaped learning centre to teach the public about climate-change resilience. Hassell+ also includes Deltares + Goudappel, Lotus Water, Frog Design, Civic Edge and Page & Turnbull, and was shortlisted for the Resilient by Design Challenge last year. Other candidates include a group comprising BIG, One Architecture + Urbanism (ONE) and Sherwood Design Engineers – which is developing a proposal for Islais Creek – and landscape firm James Corner Field Operations, which suggests widening the mouth of the creeks at South Bay. The teams will develop their site-specific schemes in the coming months, with input from local residents, city officials, and community-based organisations. The final designs will be revealed in May 2018, ahead of the Global Climate Action Summit in San Francisco. The Resilient by Design Challenge follows a string of efforts by US cities to develop urban proposals in response to climate change, after a series of devastating and unpredictable weather events over the past few years. Boston, Miami, Houston and New York are among those planning ahead.